After dodging this restaurant several times, I decided it was time to give it a try. The first few times, the line was outrageous or no parking was available... but this time, my friend and I decided we would wait if necessary. Publican Quality Meats is exactly what you think. It is a spin-off of The Publican, a popular restaurant located just across the street. During the lunch hour, the chefs create unreal sandwich combinations that you would never think of. From the more classic Cuban Sandwich to a twist on Fish & Chips, you can never guess their next creation. The food is absolutely some of the highest quality and best tasting in Chicago (when it comes to sandwiches). The cost is student friendly, averaging $15 per person with a beer. Unfortunately, the location is what makes PQM a difficult place to frequent. Minimal street parking is annoying and the communal tables are outright awful. But, I still highly recommend the restaurant. I think next time I will order pick up to save some time and minimize picking up all the gossip from your table mates. Anyway, I gave it a 4.5-mile rating. If they changed the seating style, perfection would be reached. Once again, the pork belly creation grabbed our attention. My friend and I decided to split two sandwiches, the first being the pork belly gyro. Rolled inside a griddled flatbread, the chef creates complex flavors by using a braised pork belly, pea shoots, and a calabrian chili vinaigrette. A raita adds that creaminess we all know from a classic gyro and a quick pickled veggie salad is served alongside. Whenever you eat late-night in Greektown, you expect a messy meal. This trend continues with this pork belly gyro. The meat itself is very rich and tender, but tends to fall out of the gyro quite easily. Cutting in half is essentially impossible without making a huge mess. That flatbread is a great vessel, holding its own more than a piece of pita would do. Its tough to beat a pork belly sandwich... until you see the one below! For $11, you can't go wrong by choosing this sandwich. Whenever Lent rolls around, restaurants take advantage of the fish & chips dish. Publican Quality Meats has an interesting twist on the classic english dish... a twist that doesn't involving frying. Fish & Chips here means an open faced sandwich started with dark rye toast. It is then topped with smoked trout, aged cheddar cheese, an aioli, celery, peppers, and finished off with a handful of salt and vinegar potato chips. Another bag of chips accompanies the meal. This single-handedly may be the best sandwich I have ever eaten. It surpasses sandwiches like Manny's corned beef and Cemitas Pueblas cemita. The bread is first of all very crunchy allowing it to hold up to all the toppings. The fish's smokey flavor doesn't overwhelm the palate allowing the more minor parts (celery and peppers) to still shine. The addition of salt and vinegar potato chips was genius. It added a little tanginess and more of a crunch factor to the sandwich. The presentation isn't the greatest, but who cares... it tastes amazing and I highly recommend it to anyone! And for $11, try to beat that. - What to do - if you are dining in, just walk over to the register area near the coffee and let them know. The host or one of the waiters/waitresses will take your name and give you a menu. When your seat at the communal table is available, they will show you to your spot. - Share! The sandwiches are good size and come with a side. I suggest splitting a couple of sandwiches with a friend. - Don't expect an intimate meal. With communal seating, it can actually be a pretty uncomfortable experience. People talk loud, listen to gossip, and are sometimes too close for comfort. UIC and the Little Italy area is for some reason saturated with Thai restaurants. There are at least five that I can count just off the top of my head. One of the ones we frequent is Golden Thai. This one is located closer to Ashland Ave., or the westside of Taylor Street. Anyway, the restaurant is usually not too busy for dine-in service, but they tend to get slammed for to-go orders and catering. The food here isn't the most authentic Thai food you can get, and their pad thai is nothing close to pad thai I ate in Thailand, but it is definitely above average. Their portions are generous and the cost of most of their dishes is student friendly. The staff is a little inattentive and the restaurant can have a weird feel when you are the only one dining in. Overall, it is a good restaurant, just not great... but as I have mentioned, above average gives them a rating of 3.5-miles. The signature dish of Thai cuisine is probably Pad Thai. This noodle dish is made with chicken, crushed peanuts, eggs, raw bean sprouts, and a variety of other vegetables. Its signature flavor comes from a tamarind sauce and lime juice. 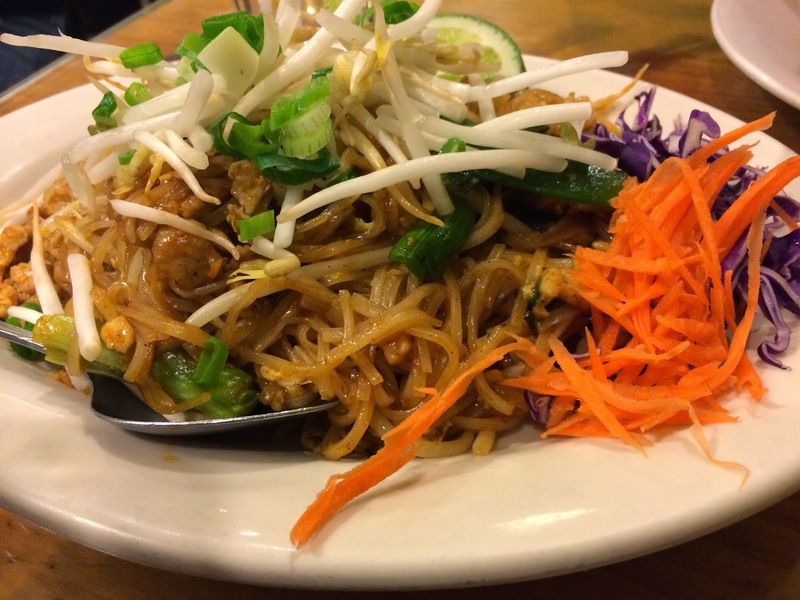 Here, the pad thai is classic. You get the choice of chicken, beef, tofu, or shrimp. I highly suggest the chicken because the chicken holds the sauce very well. The portion is huge. I think it is easily shared by two or three people as long as other dishes are also ordered. There was a nice sweet, salty, sour profile and also great contrasting textures. It isn't Thailand pad thai, but it isn't bad. I will definitely order again. The other dish we ordered was the green curry. It is made with a mixture of chicken, bamboo shoots, fresh basil, bell peppers, and that coconut curry sauce. It comes with a bowl of white rice. I will say they are very generous with the amount of protein and the size of the curry dish. However, they skimp on the white rice (which is surprisingly expensive for the amount you order on the side). I wish it came with multiple bowls of white rice, especially if you are sharing the meal. The curry isn't spicy, so make sure to tell them extra spicy if you want any spice at all. It is good, not great... but definitely above average. - Plenty of pay street parking on Taylor St. If you are picking up, flashing 15-minute parking is available in front of Pompei restaurant. - Don't get the appetizers. The shumai is a rip off. The order comes with 6 small frozen dumplings lightly steamed and served with a sauce. It costs $4 which is absolutely ridiculous. Whenever I ask for Korean BBQ recommendations, everyone seems to gravitate towards San Soo Gab San. This restaurant is located in the Lincoln Square neighborhood of Chicago. From the outside, it appears to be a small restaurant, but you will be pleasantly surprised when you enter. Dozens of tables with center cut-outs and a smokey smell fills the restaurant. I had been here prior to this dinner and so had my girlfriend. We both thought the food was great with tender meat and wonderful, authentic flavors. Unfortunately, during this experience, we had some tougher meat (making me reconsider and then lower their overall rating). The restaurant itself though has a great atmosphere and everyone seems to be talking loud aka enjoying themselves. But, because of the distance from the city (easily 30 minute drive from the Loop) and the tough meat during this dining experience, I decided on a 3-mile rating. As most people know, Korean BBQ is all about sharing. For our meal, we ordered kalbi, rib eye steaks, and marinated squid. We also ordered the seafood pancake (not pictured). Each of the meats came with a bowl of miso and over a dozen different kimchees, seaweed, and other side dishes. The meat arrives at the table seasoned, but raw. This is where the fun begins. Hot coals are added to the center metal bowl and topped with a grill. Just place the meat on the grill and cook to desired temperature. Each meat takes different amounts of time with the squid finishing in less than a minute. I thought all the proteins were tasty. The kalbi had that traditional salty, yet sweet flavor to it. The steak had a classic grill flavor and the squid a nice spiciness prevailed. Unfortunately, I think the overall disappointment was the toughness of the kalbi. No one expected it to be tough, especially since everyone has eaten here before. It was strange. The rib eye steak was delicious and tender... we actually ended up ordering a second portion. All of the kimchees and side dishes were similar to most places, but were just average at best. Nothing stood out as memorable and nothing differentiated it from the other Korean BBQ places. - All about SHARING. The portions are large and it is more enjoyable to try all of their offerings. - Great Korean beer. It reminds me of an amber ale with a little more sweetness to it. - Don't rely on their parking lot. They have maybe half a dozen spots in a very small and tight parking lot. Only the first few tables get a spot. However, there is plenty of free parking along the streets. Wings are some of the most subjective food you can eat. People like wings for the flavor, for the size, for the restaurant, and some for the sides. 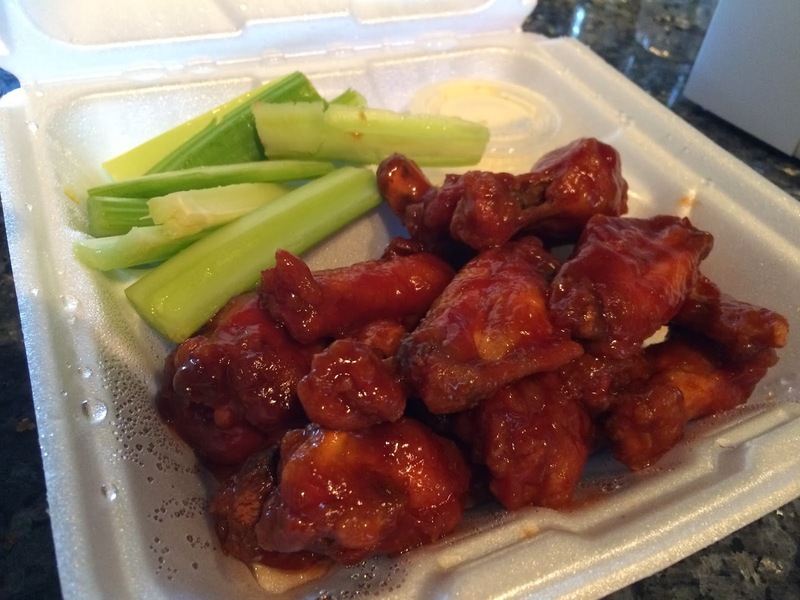 For me, when it comes to chicken wings... one place stands at the top--Buffalo Joe's. This cash only establishment is located just minutes from Northwestern University in Evanston. So technically, these aren't the best wings in Chicago (even though I still consider them the best). Here, the menu is fairly simple... choose a single or double order, your sauce, whether or not you want waffle fries, and finally get an RC Cola. The food here is delicious and you will not leave hungry. The price is very reasonable and the staff is friendly. Being cash only, it does create an inconvenience, but this along with the long drive from the city can all be overlooked after that first bite. I would walk from Chicago to Buffalo Joe's, so the 5-mile rating was deemed appropriate. A must try restaurant! I was introduced to Buff Joe's wings several years back. My buddy told me there was one way to order them... Single order, suicide sauce. 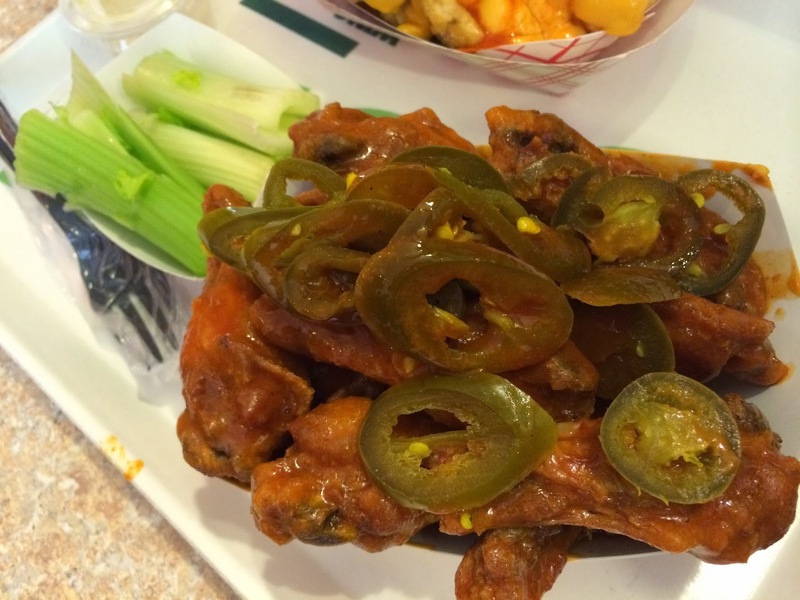 These wings are lightly fried before being tossed in their suicide sauce and topped with a handful of pickled jalapeños. It comes with a side of ranch and celery. Where to start--the single order of wings comes with about 15 wings that are cooked to perfection. The meat is tender and the skin just slightly crispy. The hot sauce was just enough to make your nose sweat, yet your taste buds are still alive. The jalapeños add an additional jolt, kicking the sauce up a notch. They wings are of course a little messy, but what can you expect with a small paper boat overflowing with saucy wings. The celery was fresh enough and ranch was standard. Delicious! I was also told that another must have with every wing order is their suicide cheddar chips. This dish is made with waffle fries topped with canned cheddar cheese sauce, suicide wing sauce, and then the same pickled jalapeños. Right out of the fryer, these waffle fries are amazing. The spiciness from the suicide sauce and of course that artificial cheddar flavor reminds you of ballpark food. Unfortunately, the cheddar cheese sauce cools really fast and turns almost to a curd-like consistency. The flavor is still there, but the texture is too weird to eat. I ended up scraping off some of the cheese towards the end and just eating the fries with the jalapeños. After finishing up my wings, I ordered a BBQ, single order to go for the girlfriend. These are the same fried wings tossed in a sweet and tangy BBQ sauce. It also comes with a side of celery and ranch dressing. I was pleasantly surprised to find the wings still crispy and tender after reheating them for dinner. The BBQ sauce was more on the tangy side than sweet. I definitely prefer ordering the suicide or even just the hot sauce, but their BBQ sauce is a good alternative if spiciness isn't your thing. - Bring CASH! This place is CASH ONLY. - The chicken tenders are another possibility rather than wings. The prices aren't on the menu, but it costs the same amount of a single order wings. - They do have an ATM, but DON'T use it. They charge $3.00 per transaction which is essentially highway robbery. Not many places in Chicago pride themselves in serving New York City style pizza. It wasn't a surprise that the one place to do it was the same guys behind New York Bagel Co. When I first noticed the pizza place in Ogilvie Train Station, I was curious how the city would react. With signage that magnified SLICES rather than NYC, you could tell the owners were also hesitant. And with some website online showing the place as CLOSED, I was simply just confused. However, my friends and I were still able to grab a few slices at the still open restaurant. We had a groupon, which definitely helped out; but at about $5.00 a slice, it doesn't brake the bank. The pizza itself is hit or miss. Some of it is fresh which makes it much better, while others have been sitting around, making the pizza crust tough. They appear to have great toppings, but later in the afternoon, they stop making fresh pizzas, meaning you have to choose from whatever is left over. I was pretty disappointed with the lack of options despite their extensive menu. For those reasons, this pizza joint barely made average in my books. 3-mile rating is what I gave it. I strayed away from the typical thin crust NYC style pizza with this slice. The veggie supreme was their pan pizza version. This one was topped with spinach, artichoke, mushrooms, sausage, and mozzarella cheese. The crust was thicker and very moist and crispy. It sort of reminded me of Pizza Hut. It is on the drier side in terms of sauce; luckily, the cashier gave me a side of marinara for it. Add plenty of red hot pepper flakes and dip into the sauce and you will find a descent slice of pizza. For the other slice, they unfortunately had a limited selection with none of their specialty slices. So I stuck with sausage and mushroom. I was pleasantly surprised to find a nice spicy sausage and mushrooms on each bite. The crust was the thin version, making it crispy under the pizza, but almost inedible on the crust. The crust was dry, and flavorless and like I said, inedible towards the end. The slice is huge; honestly, larger than my head. It is filling, but I think 1.5 slices is the best amount of food. With a Groupon, it is worth the price... without, I would definitely think twice. With a limited option of vegetarian slices at night, my roommate decided to stay away from the classic cheese and order a slice of their Mac 'n Cheese pizza. The name of the pizza is self explanatory. They have baked mac 'n cheese sitting on top of their typical thin NY style pizza crust. There is no pizza sauce. Overall, the flavor was good. It actually reminded me of eating homemade mac 'n cheese. I did think it was a little on the dry side. The lack of pizza sauce made it essentially a cheese block. The pizza was warmed prior to heading home, unfortunately, the thin crust didn't hold the heat well. The size of the pizza was huge. Two slices per pizza box is not bad for the price... but the groupon helps even more. The other slice of pizza was the NYC sausage. Still on that extremely thin crust, italian sausage slices topped the classic tomato sauce and mozzarella cheese. This one was more fresh, signified by a much softer and more addicting crust. The sausage had a little spice to it, but not enough to persuade one to not use plenty of crushed red pepper. It was also fresh enough to still bend in half like New Yorkers do. It was once again a large slice, but still not as satisfying as Chicago's deep dish slice. - Check on Groupon for a deal. We paid $7 for any two slices of pizza and two fountain drinks. This is about a 40% discount or so. - Don't come too late. They stop making their speciality pizzas early in the day and only have a few of those unique slices at night. Most of the night time slices are the classic cheese, sausage, or pepperoni. Located near the Columbia College dorms, Pauly's Pizza-ria is one of those late night joints similar to the Greektown area near UIC. They offer tons of options from pizza to wings to gyros and more. But, just like many of those late night joints near UIC, the food just turns out to be pricier when sober and average tasting at best. The atmosphere later at night is a little strange with some random person coming in and singing and then leaving without another word. I may being a little harsh on the restaurant because I know I can cook the same wings we ordered. But, all I felt comfortable giving Pauly's was a 2.5-mile rating. The menu here is extensive. It took several minutes to comb through it all, but in the end, we stuck with an order of 6 jumbo BBQ wings. These were coated in a thin layer of Sweet Baby Ray's BBQ Sauce after being flash fried. We decided on BBQ sauce rather than Frank's Red Hot and other variations of store bought hot sauce. I will say, the wings are cooked to order and are larger than some of the smaller wing joints. But, why would they use a store bought sauce... I could make this myself at home. The carrots and celery that accompanied the wings were not the freshest and arrived in a puddle of water. They biggest downer was the price for me. Non-special wings at over $1.00 per, it just doesn't make sense to me. - Late night restaurant! There are a couple in the area. May be worth giving the other one a try. - Don't expect the highest quality food, but I guess I shouldn't have either. Location: 1120 S. Michigan Ave., Chicago, IL 60605 and multiple other locations. Yolk is one of the most well-known breakfast establishments in Chicago. Throughout the past 7 years I have been in Chicago, I have frequented this restaurant and also watched it expand from one to now several locations all around the city. I like to consider Yolk one of the "BEST BANG FOR YOUR BUCK" restaurants. When you order a meal here, expect to get enough for two or maybe even more. I can honestly say I have never finished my entire meal here... and I have a pretty big appetite. When dining in, the atmosphere feels like a really big diner. The staff is quickly moving, yet still attentive. They do like quick turn around, but I never felt rushed. And, ordering take out is just as good. They don't cheat you on the portion size. When it comes to breakfast places in the city, I consider this place a staple. Everyone needs to give it a try and see what they have been missing out on. All of these great reasons lead me to rate them at 4.5-mile ratings. Can't wait to be back! My girlfriend ordered the 2x2x2x2 combo, which I will admit, I thought wouldn't be worth it. It sounds plain, but was I wrong. The huge platter comes with 2 eggs (she chose over medium), 2 hickory smoked bacon strips, 2 sausage links, your choice of either 2 pieces of french toast, 2 pancakes, 2 crepes, or half a waffle. She stuck with the french toast. Honestly, the breakfast is classic, but it is amazing and extremely filling! The french toast by itself was a meal, especially with the two slices cut in half making 4 pieces. Dip those in some honey and it can't be beat. The bacon is extremely thick cut and cooked to have both a nice crunch, yet a great chew to it. The sausage links should be described as bratwursts because they are easily 3 times the size of a typical breakfast sausage link. And with the added benefit of 2 eggs, you really can't complain. The price of this meal is $8.50, which is unbelievable cheap. This would have lasted her 2-3 meals, but lucky for me, I got to eat a got portion of it as well. Its always a tough decision for me when it comes to omelets/frittatas. I never know whether to build my own or choose one of their combinations. This time, I stuck with their Tuscan Frittata. The ingredients were incredible... scrambled eggs mixed with chicken, sun-dried tomatoes, basil, and red potatoes. These are all baked together before being topped with goat cheese. It comes with a side of either pancakes, toast, or an english muffin. This was definitely the best bang for your buck. It had two premium ingredients in the chicken and goat cheese. Both were plentiful and flavorful. The goat cheese was both creamy and sharp, taking precedence over most of the other ingredients, which I really enjoyed. The sun-dried tomatoes added a pop in sweetness to the dish. And, the basil reminded me of pesto. Great frittata, and huge portion... can't complain about this breakfast! Whenever you order an omelet or scramble or a few of their other specialty dishes, you get the choice of pancakes, toast, or english muffin. For $2.99 more, you can upgrade the pancakes to one of their specialty cakes. I chose the Banana-Blueberry Crunch Cakes. These were made with a multigrain batter mixed with almond granola and blueberries. It is then topped with both bananas and honey. Once again, the size is outrageous. This side of pancakes was big enough for a meal and came with my actual meal. The cakes themselves retained the fluffiness despite ordering take out and still had a little crunch from the granola. The blueberries and bananas were both fresh and a prominent sweetness was established with that honey. I honestly didn't need to pour any syrup on top. Great pancakes! - I suggest calling ahead to see how long the wait is. This place gets crazy packed on weekends. - Whenever we order take out, we call the less busy locations (Ogilvie Train Station). This is a newer location so the food is ready in about ten minutes as opposed to half an hour. - Do upgrade your side of pancakes to one of their specialty ones. It only costs $2.99 more which is a steal when you consider the real price costing about $10. - Don't drive to the south loop location. IMPOSSIBLE to park. They do validate at garage next door but I think it is still about $12. - I wouldn't come during peak hours unless you don't mind waiting for an hour or so. Finding good Italian food in Chicago seems to be more of a chore than enjoyable. There are some great ones and even more pitiful excuses for Italian cuisine. It becomes even more of an adventure when you try to find good Italian street food. When I stumbled across L'Appetito, I was hoping this more street food style restaurant would be the answer. Unfortunately, it didn't even come close. First of all, their menu is essentially sandwiches, a pasta salad, and arancini. Personally, the arancini had the potential to bring them to the next level, but the arancini fell flat. It was beyond oily and mine even came out cold. The restaurant itself is more like a cafe with no servers. Be sure to grab extra napkins to wipe off your table! I was extremely disappointed with this place and could only give them a 1.5-mile rating... and that's being generous. With two arancinis on the menu, I decided to give both a try. The first was the meat ragu arancini. This risotto ball is stuffed with ground beef ragu mixed with mozzarella cheese and peas. It is then rolled in bread crumbs before being deep fried. When first breaking the arancini in half, I found it to be an oily mess. It must have filled with oil during the frying process. The amount of filling was definitely subpar with one half of the arancini having barely any of the ragu. The other arancini I tried was their spinach and ricotta version. And, it was filled with just that, a mixture of chopped spinach and ricotta cheese. This was was just as disappointing because it was much colder than the ragu one. If you can tell by the picture, the filling didn't even fall out of the arancini when cutting it in half. This one wasn't as oily, but still not that appetizing. - Ordering process: Head to the back and order at the deli area. Then carry your food to the front of the store to pay. It seems confusing because there are plenty of tables, but those tables are used after you pay for your meal. - I find this place to be more of a tourist trap near Michigan Ave., and for that reason, I don't recommend it at all. Whenever I hear the word deli or corned beef in Chicago, the first place that comes to mind is Manny's. I understand that Chicago deli's can't compare to New York's, but Manny's does an amazing job and has done so for decades. Located near Maxwell Street Market (near Roosevelt Rd. ), this restaurant has been providing Chicagoans with sandwiches piled high with their signature corned beef and pastrami. The atmosphere is very relaxed with a cafeteria style arrangement. Customers walk to counters and stare at all the amazing home-cooked style meals that can be ordered. Just point and the dish will be quickly prepared before being handed to you. However, despite having some of the best deli sandwiches in the city, the side dishes were not only expensive, but subpar in taste and temperature. And for that reason, I couldn't give it a perfect rating... but 4.5 miles is still incredible! It had been a while since I dined at Manny's, so I randomly decided to give their breakfast a try. I usually crave their corned beef, so when I saw the corned beef hash eggs benedict, I was sold. This dish had a base of a buttered english muffin cut in half and toasted. It was then generously topped with their house-made corned beef hash, followed by two poached eggs. Hollandaise sauce was poured on top and it came with a side of house potatoes and bowl of fruit. Once again, Manny's found a winner. The corned beef hash was so much better than most breakfast joints, probably because they use the same corned beef that they pile high on rye bread for their sandwiches. It is super tender, has great chunks of meat and potatoes, and the flavor was spot on. The english muffins were held up nicely, but one suggestion could be to try biscuits. Make sure to pop the yolk of the poached eggs and mix it into the meat. It makes everything rich. You will not be disappointed with this meal, even when the checks, you will find only a $9.00 charge! After coming here quite a few times, I decided to try one of their signature sandwiches rather than the single meat sandwiches everyone orders. The Chazzer combines Manny's two specialties... the corned beef and the pastrami. Each is piled at least two inches high in between two slices of rye bread. On top of all the meat is an ice cream scoop full of coleslaw and a slice of munster cheese. You have the option of 1000 island dressing which in my opinion is not needed. The corned beef and pastrami are both extremely moist and seasoned to perfection. There is just enough fat left on the meat to give that extra flavor. Pepper is the main spice that fills your mouth and it goes well with the sweet mayonnaise based slaw. I couldn't taste the munster cheese, so I don't think it is necessary. I suggest getting this sandwich because you get the freshness from the slaw and the best of both worlds... both meats! Manny's potato pancakes or latkes are just as famous as their corned beef and pastrami. These jewish influenced side dish is made simply with potato and a little onion and is bound together with an egg mixture. They are formed into a 3- to 4-inch pancake that are nearly 1/2 an inch thick and then fried. The pancake is crispy on the outside, soft in the middle, and has an onion flavor that seems to linger. I was a little disappointed because every time I get one, it seems to be room temperature as opposed to being made fresh. If you order a sandwich, it only costs $1.00 extra to get a potato pancake, so it is an awesome deal, just know that it may not be as hot as you want. After trying the noodle kugel on my last visit to Manny's, I knew what not to get. So this time, I chose their baked macaroni and cheese. It is very different, mainly because of the long thin style noodle they use. It reminded me of the consistency of spaghetti noodles, but is hollow in the center, similar to the classic macaroni. I am unsure exactly what cheeses they use, but it seemed like a mild cheddar and some kind of creamier cheddar cheese. They don't use any breadcrumbs, but instead have a thick layer of burnt cheese the tops the dish. I enjoyed the creaminess and simplicity of the mac and cheese. I think many restaurants spend too much time making insane creations that take away the classiness of mac and cheese. But at nearly $6 for a side, it is a quite expensive way to relive your childhood. To complete the "President Obama Lunch," you have to grab a piece of Manny's cherry pie. The pie is generously filled with a gelatinous cherry filling similar to the one you find in the can, but with more cherries. The filling is overly sweet, but is toned down by the sugar lacking and dry crust. The crust is awful by itself, but somehow together with the filling makes for an addicting pie that I order everytime I come. Give it a try... it isn't like a Hoosier Mama Pie Company pie, but it does remind you of your school's cafeteria. - This place is cafeteria style so... Just walk up to the counter, DO grab a tray (you will need it), tell one of the guys behind the counter what you want and continue to move down the line. Grab your own dessert or drink at the end of the line and then approach the lady with a register. Here you will just get a ticket of what you ordered and if you want it "to go", then someone will take your tray and wrap it up. Otherwise enjoy your meal and bring your ticket to the cash register near the doors after eating and pay. - Do try the sandwiches. I know they offer a lot of other home-cooked meals, but the corned beef and pastrami are what they are famous for. - Noodle Kugel was featured on "The Best of..." on food network. Don't order it. It is not good and tends to be dry. - Don't order too much food here. The portions are much bigger than expected.